Cocktail Drops are the end result of a development process that began in 2012. The goal was to create an entirely new form of cocktail that would provide a singularly unique and surprising experience, while being exceptionally high in quality and radically innovative. Years of experimentation ultimately led to the invention of a recipe and preparation process that together produced unexpectedly extraordinary cocktails. Cocktail Drops are handcrafted cocktails formed into solid drops that melt in your mouth. The drops have a smooth, custard-like consistency when first bitten into, and then melt into liquid sips. They are made with premium spirits and only the freshest pure ingredients – every drop of juice used to make Cocktail Drops is cold-pressed in-house from whole fruits. Eight drops collectively contain the alcohol content of one cocktail, the equivalent of 1oz of an 80 proof spirit. Each drop is roughly the size of an olive, and they are enjoyed one drop at a time in the same way a traditional cocktail is enjoyed one sip at a time. Cocktail Drops are best enjoyed by biting into them and savoring the medley of flavors that erupts from them as they melt. Sangria Cocktail Drops, for example, smell of cinnamon, and when bitten into the first thing that will be experienced is the smooth, custard-like texture that all Cocktail Drops possess. The drop instantly starts to melt into a liquid sip, causing the person enjoying the drop to immediately taste, in rapid succession, the richness of the Garnacha wine, a touch of tartness from the green apple juice and lemon zest, sweet citrus from the Cointreau and orange juice and a wonderfully subtle cognac finish. Then it’s on to the next drop. 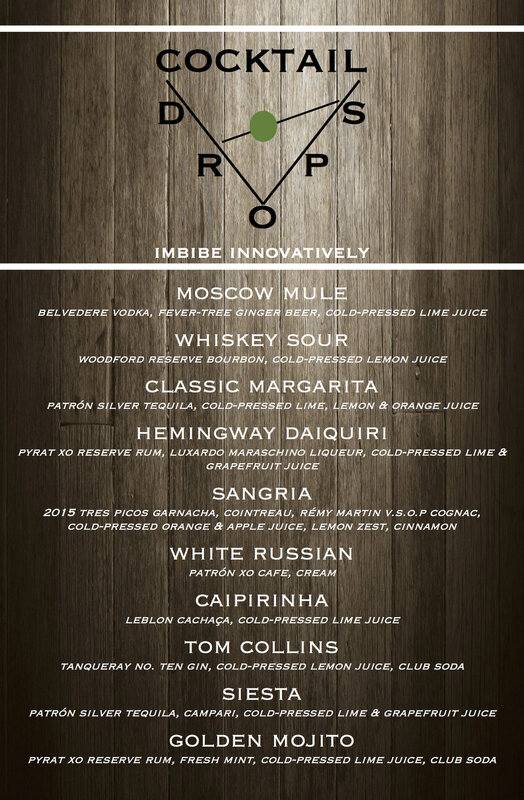 If you are prepared to make Cocktail Drops an integral feature of the food & beverage service at your venues, Empire is prepared to work with you to make that possible. 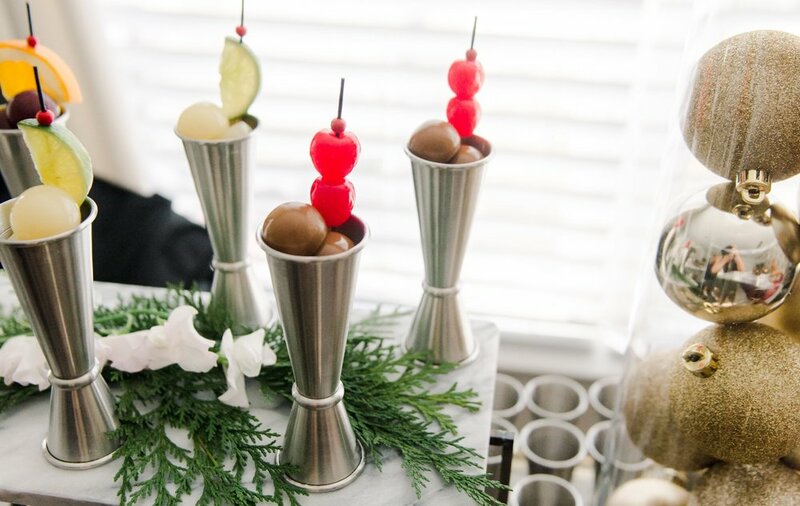 Serving Cocktail Drops at a catered event is a wonderful way to surprise and thrill guests, as they provide a decidedly unique experience that distinguishes an event's mixology offering. The cocktails are served in glasses that each hold 4 individual drops, which collectively contain the alcohol content of ½ of a cocktail. They are accompanied with an appropriate garnish and a martini pick, which is used to spear the drops and place them in your mouth. Clients select up to 3 cocktail types from the menu below, and a member of our team serves the cocktails during the event from an interactive catering beverage station featuring continuous dry ice fog effects. Our team provides all service materials, including glassware, display stands and martini picks. Additional cocktail types can also be made to order, and alternate spirits brands can be used if desired. We have a short lead time, and can usually prepare for an event with as little as 3 days' notice. Cocktail Drops can be served rapidly because they are prepared in advance, making the process of getting a cocktail as quick as selecting hors d’oeuvres. Cocktail Drops are meticulously handcrafted using premium spirits and the freshest pure ingredients, ensuring that every drop is mixed to perfection to provide the most delicious, balanced cocktail experience. During a busy event, mixing a traditional cocktail with the precision necessary to achieve comparable quality is often not possible. Cocktail Drops provide quality consistency, with the added benefit that they never become watered down due to melting ice. Cocktail Drops enable the easy sampling of cocktails because each glass holds only ½ of one cocktail. If a person wishes to have two total cocktails, but can’t decide between having a Margarita, Whiskey Sour, Sangria or Moscow Mule, he or she can choose to have two cocktails comprised of one glass of each of those cocktail types. Interested in forming a partnership, having us cater your next event or simply learning more about Cocktail Drops? We’d love to hear from you! Please submit a message using the form below or email be@cocktaildrops.com, and we'll get back to you as soon as possible.